While the subject isn’t one most people prefer to discuss, when you own an expensive antique Oriental rug or beloved handmade textile, it’s an idea you’ll certainly want to entertain. 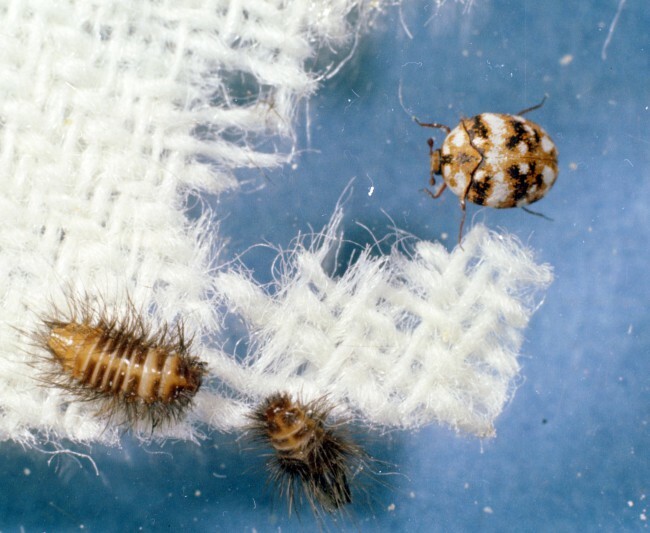 Today we’re talking about moths and carpet beetles, which are two of the most destructive pests for anything made of natural materials, and rugs in particular. If you’ve had prior experience with moths and carpet beetles, you already know what kind of toll they can take on clothing, bedding and other related items. Some of these things are replaceable, but a rug usually isn’t, so it’s important to know how to protect your investment from this kind of rug damage. Below are a few ways to keep your rug in great shape and avoid unnecessary exposure. However, if you’ve already noticed damage from moths or carpet beetles, you can bring your Oriental rug to us for repair and we can get it looking like new once again. If you have your rug in a high-traffic area, it’s very likely that your precious article won’t become exposed to moths and carpet beetles. But to ensure this doesn’t happen, it’s always best to keep your carpet as clean as possible through regular vacuuming and having your Oriental rug professionally cleaned at least once a year. Also, if you spill any food or drinks on your carpet, be sure it’s cleaned immediately, as moth and beetle larvae thrive on these types of food sources. You’d be surprised how easily a moth or carpet beetle can get into even the tightest of spaces, so when storing your Oriental rug, make sure it’s in an air-tight container of some kind if at all possible. This is usually difficult with larger rugs, however, so another option you can employ when storing your rug is having it wrapped in a safe plastic and secured appropriately. An important tip to remember though is that some plastics can degrade a rug’s materials over time, so be sure to speak with one of our professionals on the proper way to store your Oriental rug. One option for storing your Oriental rug is by using a cedar container, which contains natural oils that will successfully deter and even kill the larvae of moths, though it won’t protect you against adult moths or the eggs themselves. However, the scent in your cedar storage container is important, so if the scent has diminished it won’t be as effective in doing its job. Nevertheless, you can easily replenish the scent with a light sanding or by adding cedar oil to its interior – just be sure to let it dry before storing away your Oriental rug. Because mothballs and moth crystals release an odor, which is attributed to the pesticide they contain, we don’t recommend using them on or near your Oriental rug. They’re also unsafe in the event a child or pet is exposed to them, so it’s better if you can find an alternative to this kind of protection. While it might seem like a myth, a sachet filled with lavender, or covered in lavender oil, works to prevent moths from entering the storage space where you keep your Oriental rug. We should mention, though, that lavender will not kill eggs or larvae, making it important to ensure the area is already free of these pests before you put your rug away. If you have any other questions about protecting your Oriental rug against moths and carpet beetles, or you’d like to have your rug assessed for damage, please visit us at Ahdoot or speak with a rug specialist.